Early Sunday afternoon, Bob Mansfield, Apple’s senior vice president of technologies, disappeared from the company’s Web site, his biography removed from its executive profiles page without explanation. Now, we know why. Sort of. 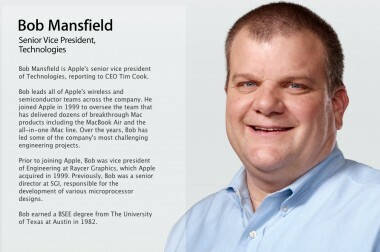 Mansfield is no longer a member of Apple’s executive team. The disappearance of Mansfield’s bio from Apple’s Web site was first reported by MacRumors. Mansfield, a longtime Apple exec announced his retirement from the company in June of 2012 only to return to it a few months later in a new, larger role following a big executive shakeup. He agreed to stay at Apple for an additional two years, serving as SVP of Technologies, a position charged with overseeing Apple’s wireless and semiconductor teams. Recently, he has been rumored to be working on wearable computing devices like the company’s mythical iWatch. Which makes his sudden removal from Apple’s executive team and abrupt disappearance from the company’s leadership page all the more curious. Mansfield’s departure from the company caused some organizational pain inside Apple and the company paid a lot of money to bring him back — a cash and stock package worth about $2 million a month. That it would now move him off the executive team — whether it be at Cook’s request or his own — not a year later is unusual indeed.